After the phenomenal success of "Que Sera, Sera", it seems that Doris's single hits were few and far between. At most, there were two or three singles a year, and most of those were theme songs from her many hit films in the late 50's and early 60's. It was the time when the movies overshadowed the music. That does not mean, however, that there were no more signature or important songs for her...that is far from the truth no matter what the record researchers have to say. One thing more, and it is very important. By the end of 1956, the majority of top selling records were by artists primarily considered rock and roll. Better than 70 percent of the jukeboxes were dominated by rock and roll artists like Elvis Presley, Pat Boone, Fats Domino and others. It was rare indeed for pop artists of the earlier 50's to still have major hits; in fact, any hits at all. But Doris Day and Perry Como and only a handful of others managed to hold their own through the mid-60's, and that says a lot about how important they really were. It was released as a single but did not do much in the way of mass sales (another missed opportunity?). 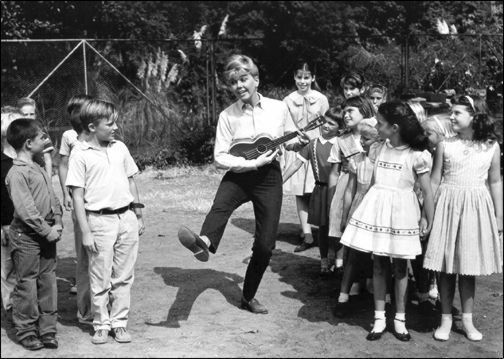 The flip side was called "Rickety-Rackety-Rendevous", another of Doris's many charted novelty songs. 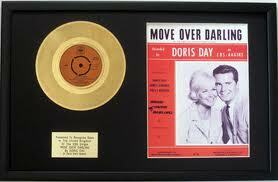 The only other release that year was a two-sided single in which Doris dabbled with some modern jazz. Side A was called "Twelve O'Clock Tonight" and the flip was "Today Will Be Yesterday Tomorrow". In 1958, three movies produced some charted songs, as well as some jukebox favorites. 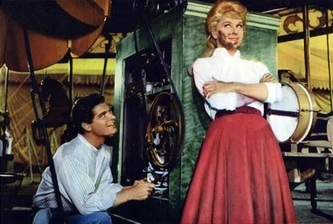 The title songs from "Teacher's Pet" and "Tunnel of Love" both garnered Doris more signature songs and thousands of jukebox spins. The flip side of "Tunnel" (also from the move) was called "Run Away Skidaddle Skidoo" (click on the song to hear the version from the film in German). The flip side of "Pet" produced another well deserved Oscar nomination. It was called "A Very Precious Love" from the film, "Marjorie Morningstar". 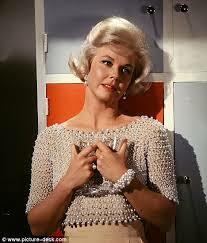 But the biggest hit for Doris in 1958 was what has been widely publicized as Doris Day's last Top Ten Hit. Riding the charts that year along with Perry Como's "Catch A Falling Star" and Peggy Lee's "Fever", was Doris' snappy duet with herself called "Everybody Loves a Lover". On her tv special in the 70's which featured Perry Como as a guest star, he called it the Ba Joom Boom song. The flip side also managed a big share of spins; it was called "Instant Love". 1959 is another significant year for Doris. This time, it is not for music so much as it is for films. 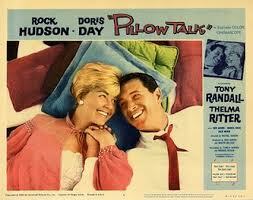 The whole world fell in love with Doris in PILLOW TALK, and certainly the title tune got lots of airplay, as did the flip side, "Inspiration". 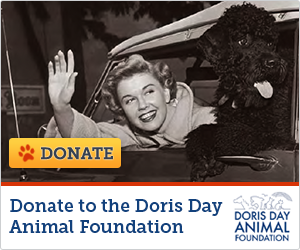 It was the only time that Doris was nominated for an Academy Award, which she did not win, but other major organizations that awarded acting honors gave her the nod. This was also the year for that mysterious comedy film, "It Happened To Jane" (which co-starred Jack Lemmon and Ernie Kovacs). It was a great vehicle for the three stars, and it went almost nowhere, as did the two songs released from the film: The Title Tune and "Be Prepared" (a song that should have been adopted as a theme song by the Boy Scouts of America). No one has ever been able to figure out why this film was only a minor box office hit coming as it did between the two box office giants, Teacher's Pet and Pillow Talk. It is anyone's guess. As for the songs, both had the earmarks of hits and are rarely remembered. The same is true of two other gems, quietly released in late 1959. It was a pairing of "Through The Eyes of Love" with "Nothing in the World"...two sure fire hits, had they been given proper publicity. And yet, few people have ever heard them. This one was a Grammy Nominee and the most often played version of the title tune from the movie, even though Julie Andrews sang it in the film. Another great novelty tune from '59, After "Everybody Loves A Lover" becames such a big hit in 1958, this should have made its mark on the charts. Alas, once again, Doris was being held back by her, by then, disinterested Columbia publicists. A career changing film for Doris and an Oscar Nomination to boot, even though her only one. For some strange reason, comedy performances rarely win an oscar, even though any actor knows they are the hardest roles to pull off. This song got lots of air and juke box play; it was more popular than the movie from which it came. Any dancer found of jitterbug can also tell you it had a great driving beat for dancing. Doris sang a spoof of the Mamie Van Doren song in Teacher's Pet, "The Girl Who Invented Rock and Roll". It should have been released as a single. 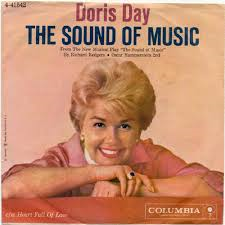 For the most part, single music by Doris in the 1960's primarily consisted of released title tunes from films or a random song or two featured in one of them, no doubt to increase the popularity of the films. Much more of her time was spent producing albums containing some musical gems loved by all who own them...but none of these (except "Jumbo" ) was a soundtrack collection. 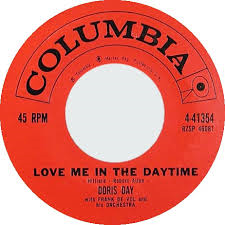 In later years, Columbia Records (then) and Sony Products (today) have increasingly distributed more and more anthologies of music featuring past singles by Doris of both released and unreleased material. The album cover pictured with this paragraph has become a consistent seller covering the music of the early 60's as well as a collection called "The Happy Hits", which features many of the songs from the 60's which charted for Doris but not in the top 10 or 20...or even 30. 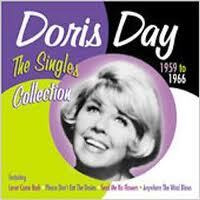 To start the 1960's, Doris treated fans and music enthusiasts to four singles (or 8 songs). Two of the singles featured songs from "Please Don't Eat The Daisies". One was the title tune (with a group of children) and its flip side was a wonderful little song called "Here We Go Again". A second single featured another song from the movie which charted briefly but received a lot of air and jukebox play. It was called "Any Way The Wind Blows". The flip side, "Soft As The Starlight", is one of those songs that Doris seemed to like because it was released many times and was actually featured in a film 6 years later ("Glass Bottom Boat") and released yet again. 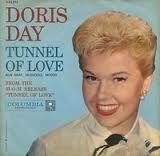 It initially appeared on Doris's first stereo album "Day By Night" in 1958. The composer, Joe Lubin, later re-worked the same melody and transformed it into the title song of Doris's 1966 hit move "The Glass Bottom Boat". When "Boat" was issued on a 45 in 1966, "Soft As The Starlight" (for the 3rd time) was placed on the flip side. 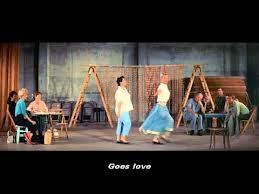 (Doris also sang a version of "Starlight" in the film as well). Columbia actually released "Starlight" as a 45 single way back in 1958 when Doris first recorded it - so this is the second appearance of this ballad (the same performance) in the Day discography. The arrangement is by Paul Weston (though he was not credited on this reissued 45). 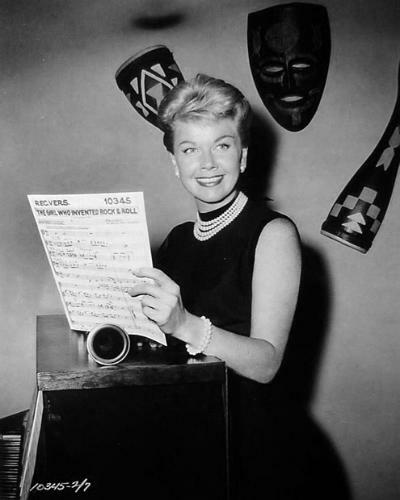 Doris sings "There They Are"
As Doris became Queen of the Box Office and as her movies became bonanzas in the early 60's, the single records released diminished in number to one or two in number, and the album releases became the place to look for new Doris music. The other single release that made a little noise came directly from the film and was called "Should I Surrender". The flip side was a very commercial sounding recording of "Who Knows What Might Have Been". 1962 left single record buyers wanting. There were no single releases, but they could feast on three albums from that year and two movies. 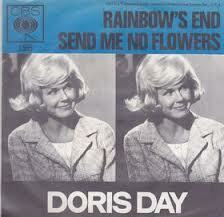 But in 1963 came one of Doris Day's most controversial recordings. It was the title tune from the film, "Move Over Darling". It charted briefly in the U.S. but it reached #8 on the UK singles charts, even though the song had been banned by the BBC for suggestive lyrics! 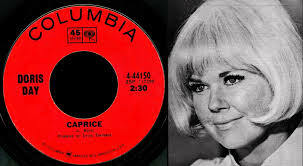 The song was a new, exciting and Sixties Friendly sound for Doris Day, and it received considerable air play in the U.S. (It should be noted that the song was partially written by her son, Terry Melcher, and the recording session included a young guitarist by the name of Glen Campbell!) The flip side was actually sung in the film and was called "Twinkle Lullaby". Another of those "why did this happen" questions also occurred in 1963. In another session, Doris recorded a song that could have been one of the biggest songs of her entire career, especially in the rock era of the 60's. It was never released, some say because her husband (Marty Melcher) did not like it. At any rate, this great song was called "Let The Little Girl Limbo". 1964 dawned with only one single release. This time it was another movie (the third with Rock Hudson) and another movie title song, "Send Me No Flowers" which got lots of airplay and charted briefly. The flip side was actually better: "Rainbow's End". A triple for 1965! That's right...there were 3 singles, six sides available for fans this year. Of course, one was the title song from the film, "Do Not Disturb". The flip side was a recording of the wonderfully funny song from the film when Doris (a bit intoxicated) does a one man band routine on the song, "Au Revoir is Goodbye with a Smile". Another 1965 single was a neat little song that could easily be used by any inventive wedding planners during one part of any reception. It was called "Catch The Bouquet". The flip side was a beautiful ballad from one of Doris' album releases. The song was called "Summer Has Gone". Last, but not least, was another really up tune called "Another Go Around" with a flip side also from an album release called "Not Only Should You Love Him". For 1966, "Soft As The Starlight" again and yet again! This was the year for one of Doris's more popular end career comedies---in two years time she would essentially leave film making and her music career pretty much behind. 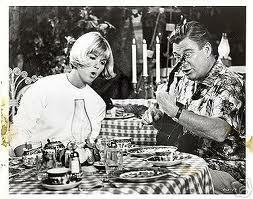 The comedy co-starred her with Rod Taylor (for a second time) and also featured Arthur Godfrey as her father. The single was the title tune, "Glass Bottom Boat". Funny thing about this title song: it is exactly the same melody as the oft recorded "Soft as the Starlight", in a much speeded up version with different words! 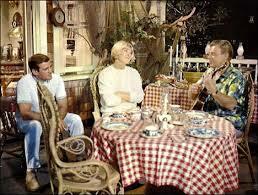 In case you happened to miss it, "Soft" became the flip side of "Boat" because she actually sang it in the film. And we are not finished with "Starlight" yet because it appeared again in 1966, this time as the flip side for another single release, "Walk A Chalk Line"! And then came 1967. It was the last year which ever saw a single release by Doris, and it was also the last year in which she sang the title song for any films she starred in after this. That title tune film song was for the spy spoof comedy, "Caprice". The flip side was another ballad, as only Doris can sing them...but this time, the words seemed a little bit prophetic. 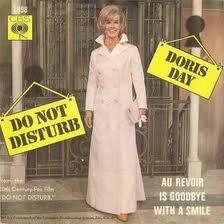 Listen carefully...is Doris saying a fond farewell to all those years of single hits? Maybe so....you decide. So...when Doris bowed out of recording/releasing single records, was that the end? Not by a long shot! In fact, her most recent album releases (two of them) were in 2012 for her birthday. But that is another story on another of our music pages. Check out our album page, "Over 60 Years of Albums with more to come". Another interesting note in the annual nationwide poll of disc jockeys conducted by Billboard magazine, she was named the top female vocalist in the U.S. in 1949, 1950, 1951, 1952, 1954, 1955, 1956, 1957, and 1958.